Following a public hearing on Jan. 12, 2017, the Wisconsin Supreme Court amended SCR 20:2.4(c) to allow a lawyer serving as the mediator in a case arising under Chapter 767 to draft the formal settlement documents. The rule requires that the lawyer obtain written consent from both parties, which would include disclosing any interest or relationship that might affect the mediator’s impartiality. The lawyer/mediator may file the settlement documents with the court, but cannot appear in court on behalf of either or both of the parties. Is this Rule a Good Idea? First, in my years of practice, there is little that has had a more profound effect upon the practice of family law than the use of mediation. When I first started, it was pretty much unknown. The use of mediation started in custody/placement disputes and, eventually, became mandatory in those cases. Today, it is unusual to litigate a case, even on financial issues, without first attempting mediation. 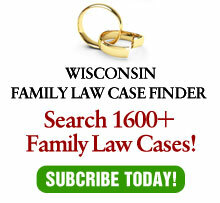 The effect is a substantial decrease in litigation of family law cases. Overall, this is extremely positive for the parties and especially for their children. Second, there is, in my opinion at least, still a substantial role for representation in some of these cases. The interesting part of practicing family law is the unique nature of each and every case in which we are involved. To use a “cookie-cutter approach” in which the same resolution works equally well for every party fails to use the variety of tools available to lawyers to customize a result that best serves the circumstances. Third, law is only semantics. All we have to use is words. Therefore, the choice of words can have a critically important effect on the parties’ future. With that said, there are many cases in which allowing a mediator to write the agreement would do good with minimal risk of any harm. A great deal of mediation involves placement issues in which the wording of the document deals only with dates and times. It is difficult to see circumstances in which the choice of words would make any difference to the parties. On the other hand, having the mediator, who is familiar with the agreement, put the agreement in writing saves time and money for the parties. Further, most of the cases in our family law system do not involve significant amounts of money or sophisticated negotiations. In those cases, it is, again, difficult to see how the choice of words could make a difference, whereas the savings for the parties could be significant. The concern with the mediator writing the agreements are those cases where there are difficult or sophisticated issues. One would think that, in those cases, the parties would have lawyers available to advise them and draft any necessary documents. However, that is not always the case. I am amazed at the number of cases in which the parties could well afford lawyers, needed them, but chose to proceed without them. Some of those people proceeded without lawyers for cost reasons. Others see lawyers as fire throwers, while most lawyers are fire fighters (certainly the good ones). Further, there are a number of mediators who do not insist that these parties have attorneys and are perfectly happy mediating (and, now, writing) agreements in situations where the parties need and can afford separate counsel. It is in those limited number of cases in which this rule can create problems. When the issues are difficult or complex, choosing the right words and negotiating the choice of these words can significantly impact the parties’ future. As an example, it is common that parties in high-income cases negotiate support not just as a simple matter of time and dollars, but also to avoid complex issues and the expense of future litigation if they need to interpret or modify the agreement. In the majority of cases (maybe even the vast majority), this rule will save time and money for parties. However, I am hoping that mediators will recommend – or even insist – that in cases where parties can afford attorneys, that they retain their services in drafting documents (and, even better, in negotiating them) to avoid the risk of future litigation. In those cases, the mediator can truly be neutral.